Dr. Constantinos K. Coursaris studies user motivations, expectations, and experiences with new media and the consequent design implications with a focus on social systems. He supplements his research expertise with consulting on social media for governance and/or marketing, and has trained diverse organizations in North America, Europe, the Middle East and North Africa (MENA). Follow him @DrCoursaris. Dr. Coursaris is Associate Chair for the Department of Media and Information. He holds a dual appointment as Associate Professor in the Departments of Media & Information and Advertising & Public Relations. He is also Professor by Courtesy in Usability / Accessibility Research and Consulting, a unit of the MSU Office for University Outreach and Engagement. Usability / Human-Computer Interaction, Social Media, Electronic / Mobile – Business / Commerce, Marketing, Health. Management / Information Systems & Strategy, Web Design, I.T. Project Management, Social Media Marketing, Advertising and Promotion Management. Improving care transitions for acute stroke patients through a patient-centered home based case management program. Patient-Centered Outcomes Research Institute (PCORI), 10/1/2014-9/30/2017, Co-Principal Investigator (Co-PI), with M. Reeves (PI, Epidemiology) et al., $2,000,000, Research Activities. 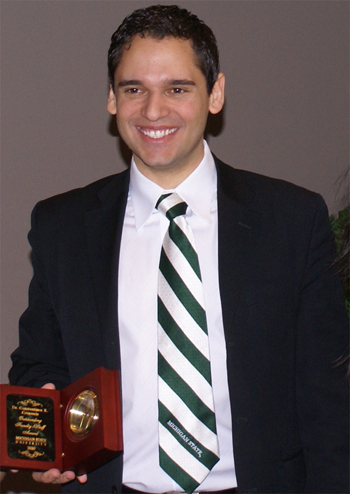 Dr. Coursaris spoke at the 2012 TEDxMSU of the tremendous opportunities ahead for “Local Spartans, Global Citizens”. TEDxMSU was was organized by MSU’s International Students Association in collaboration with the Office for International Students and Scholars.